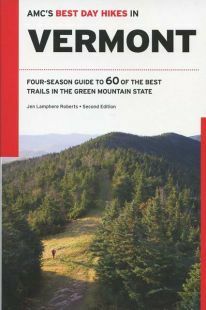 AMC's Best Day Hikes in Vermont, by Jennifer Lamphere Roberts, 2nd Edition, 2018. This updsted entry in the AMC's "Best Day Hikes" series covers a wide variety of treks (60 in all) across the Green Mountain State. Included are classic big mountains such as Mt. Mansfield and Camel's Hump, as well as smaller, lesser-known peaks, walks along the famed Long Trail, and easier treks to ponds, waterfalls and other interesting features. Map, photo and GPS coordinates for trailhead included for each hike. 304 pp., 6" x 9."